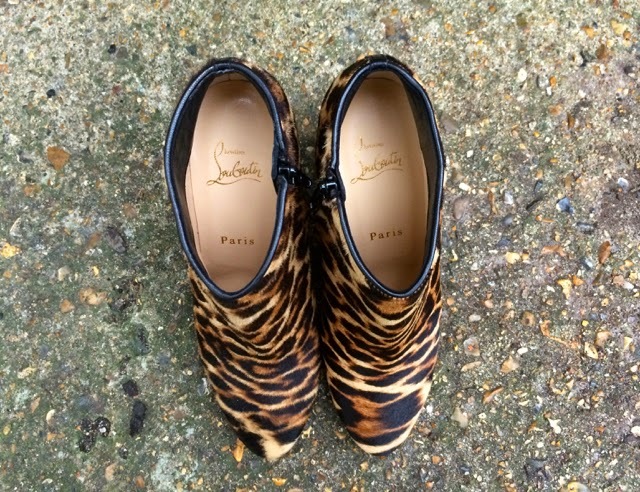 Meet the latest addition to my shoe collection, Christian Louboutin Melisa Leopard-Print Wedge Bootie. That’s right, I’ve got my grubby little paws on a pair of Louboutins. In all honesty I still can’t believe that they’re mine and that Al got them for me. When I unwrapped them I felt like the luckiest girl in the world. At first glance I didn’t notice the sole, I was far too busy stroking them. And then I flipped them and saw the delicious and iconic red. I practically passed out. They are completely perfect. At the moment they are proudly sitting on a shelf in the spare room so I can admire them every morning when I get ready. I’m desperate to wear them out the house but am far too scared to ruin the soles. I’ve been recommended buying some sole protectors but I don’t know how I feel about that. Does it really matter if the red gets scratched? What’s the point in having them if I can’t wear them? Got any advice, leave it below! Anyway, back to the boots… Here they are in all their glory. God love those red soles. Thanks Al. You’re a keeper.